Sometimes the only thing you can say is, "They sure look pretty when they're frozen." 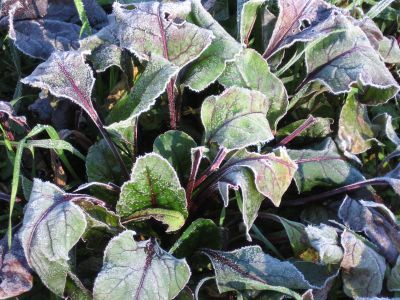 These are Crosby's Egyptian beet greens (although there's a slight chance they might be Detroit--don't ask) that survived a few nights in the 20s quite well just covered with an old bedsheet. Then I forgot to cover them. For some plants, that little bit of protection can mean the difference between death and the dinner plate. Oh well. A few leaves survived the accidental freeze, but overall the plants are now looking pretty dismal. What's interesting is that there appears to be no rhyme or reason regarding which plants died and which didn't. It wasn't only one hardy variety that toughed it out. It wasn't even just certain plants--there are many that have mostly dead leaves but a few that look fine. 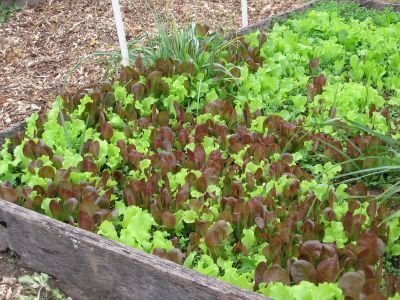 In the last post about my fall lettuce crop, I promised I would write more about my cheapie methods of extending the growing season. I'd completely forgotten that I sort of covered (ha ha) this subject back in August. So until I get around to writing more, you can click here to read all about the wonders of using floating row covers, along with some other tips on fall planting. Of course no matter what materials or methods you choose to employ, the most important thing is (surprise) to actually remember to use them, as so clearly evidenced above. 1. Gardens Alive!, a wonderful environmentally-friendly mail order company I wrote about in September (click here and scroll down to "Out Of My In Box item #2) is offering "spooktacular savings" of 20% off all items sitewide through November 1st. Just use Offer Keycode: 143032. 2. Amazon Grocery is offering a $10 instant rebate when you spend $49 or more on any combination of items, including food and household items. Just use code GROCERY3 when you check out. This offer is valid through November 30, 2006, and there is no limit to the number of times you can use it. Plus, all products offered in Amazon Grocery are eligible for Amazon Prime and FREE Super Saver Shipping. This relatively new store at Amazon.com (that I first wrote about in the article "I Can't Live Without. . . My Wide-Brimmed Sun Hat!" because they sell my favorite sunblocks) offers more than 14,000 non-perishable items, including many from some great companies--Celestial Seasonings (my beloved Tension Tamer Tea plus 90 other items), Newman's Own Organics (47 items), and even Wild Oats (110 items). There are also 55 different Seventh Generation products available. Too cold to work in the garden? Click here to start shopping at Amazon Grocery instead. And click here to visit my Farmgirl Favorites Store at Amazon and see what I can't live without. Lots and lots of beautiful fall bounty! More about it coming up. At this time of year, even the little weeds look pretty. 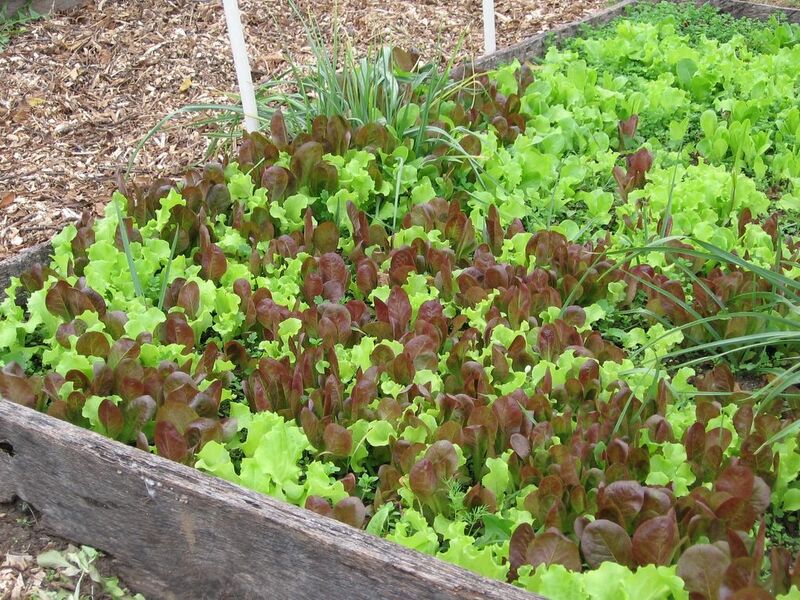 This is one of the varieties of lettuce I direct seeded into a mini greenhouse raised bed back on August 30th. I just figured out what variety it is! I read over the list I'd made of the different lettuce seeds I started in that bed and couldn't find one that sounded anything like this. For some reason (even though it's right there in my 2006 Baker Creek Heirloom Seeds catalog) I didn't include the description in my list. So it's Gentilina: "Lovely, bright green, frizzled, leafy heads that are very ruffled. Good resistance to bolting. 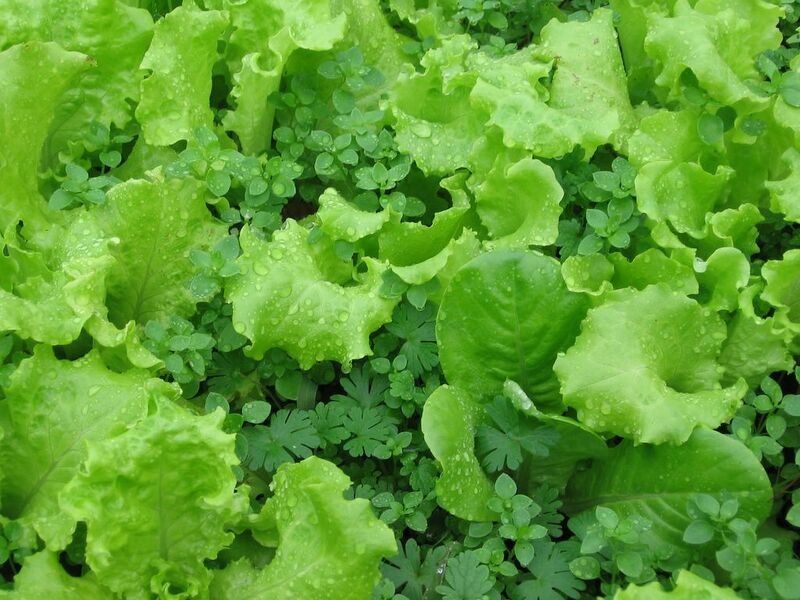 Tender leaves are first rate in salads; an extra fine Italian variety." And there's the reason I'm sure I ordered it--that "good resistance to bolting" you know I can't resist. Though the words "frizzled" and "ruffled" probably would have won me over on their own. The tender leaves are indeed first rate in salads, and I have been enjoying them for several weeks now. 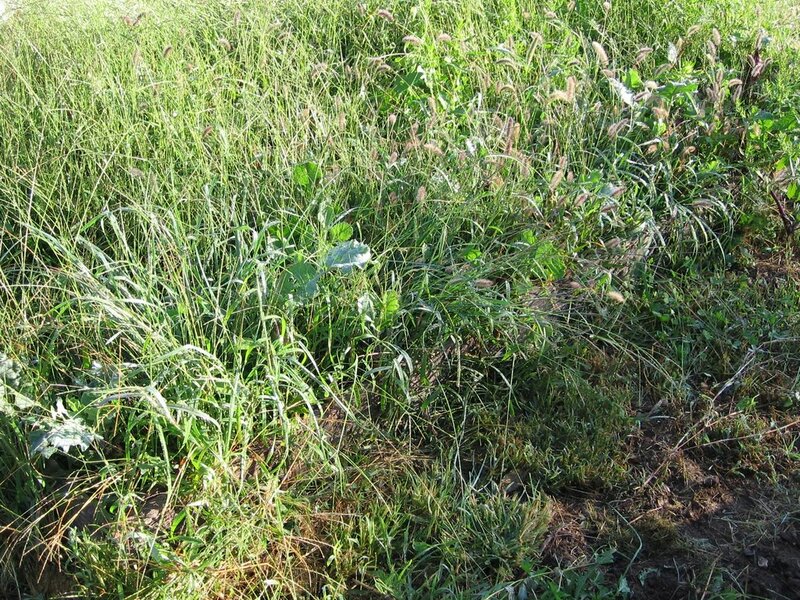 Of course hot weather and bolting aren't going to be a worry for this crop--just the opposite. So far so good. This lettuce and the other varieties that sprouted along with it have survived several 21 degree nights with minimal protection, though I did officially "set up" the mini greenhouse the other night. 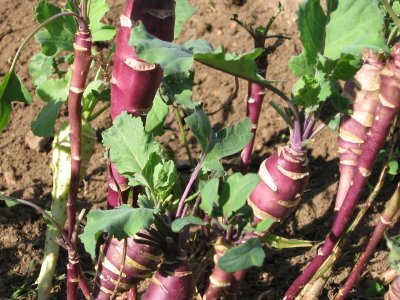 I'll write more about my Gardening On The Cheap methods for extending the harvest in my next post--which should be up soon. And don't think this site will be hibernating for the winter. No way. I have too much backlogged information from spring and summer to share--as well as lots of photos and a few more of my Less Fuss, More Flavor recipes. And of course there is something going on in the garden and greenhouse every day of the year--even if it is just protecting plants or snapping snow photos. Today it's rainy and cold, though, so I'll be tucked inside the house for much of the day, soaking up the cozy warmth. The woodstove in the living room is crackling merrily, and my wooden dough bowl is perched right next to it, full to the brim with rising dough for a new bread I just invented. Wood heat, warm bread, wonderfully rainy weather. Oh, how I do love autumn! The garden is always full of surprises. And many of them are good ones! Regular readers of In My Kitchen Garden have no doubt realized by now that unless a plant's situation is really and truly hopeless--or I am desperate for space in the garden--I refuse to pull anything out of the ground. 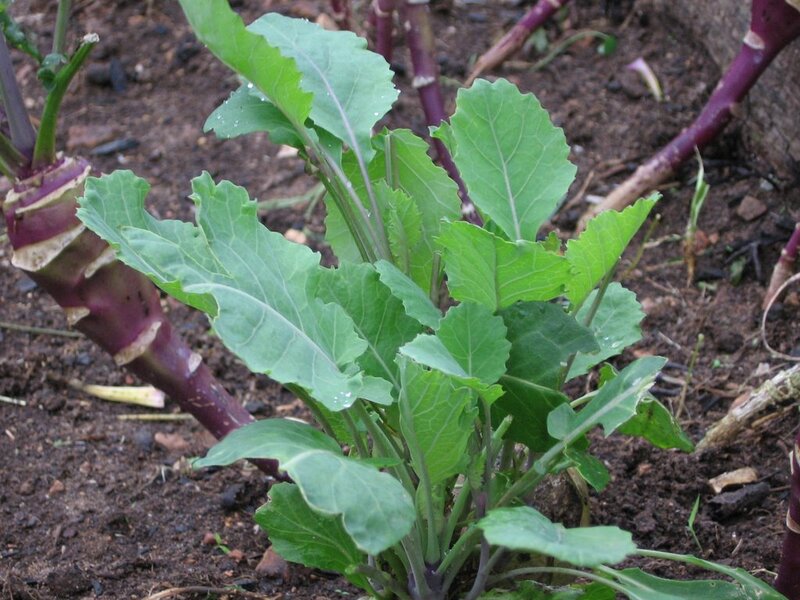 Not long after that, cabbage worms attacked my purple kohlrabi and pretty much devoured the leaves for lunch. But they quickly grew back, not caring one bit about the summer heat and humidity they found upon their return. Then Cary discovered them, and she proceeded to nibble the tender little leaves down to nothing but nubs--day after day after day after day. By this point I had given up caring that the kohlrabi bulbs had gone beyond maturity and reached the woolly point, since the only way I really like to eat them calls for using the leaves as well--and obviously I had none. I turned my attention to more edible areas of the garden, kicked Cary out of the garden, and the kohlrabi bed quickly filled up with weeds. 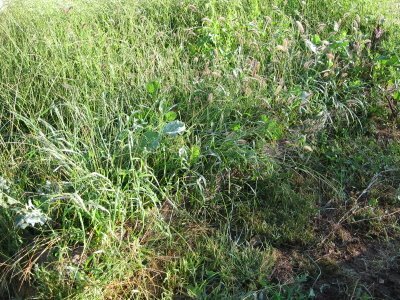 I forgot all about my crop until I went into a weeding frenzy recently and was thrilled to discover that not only had the plants survived, but that while in hiding they had put on yet another batch of leaves. 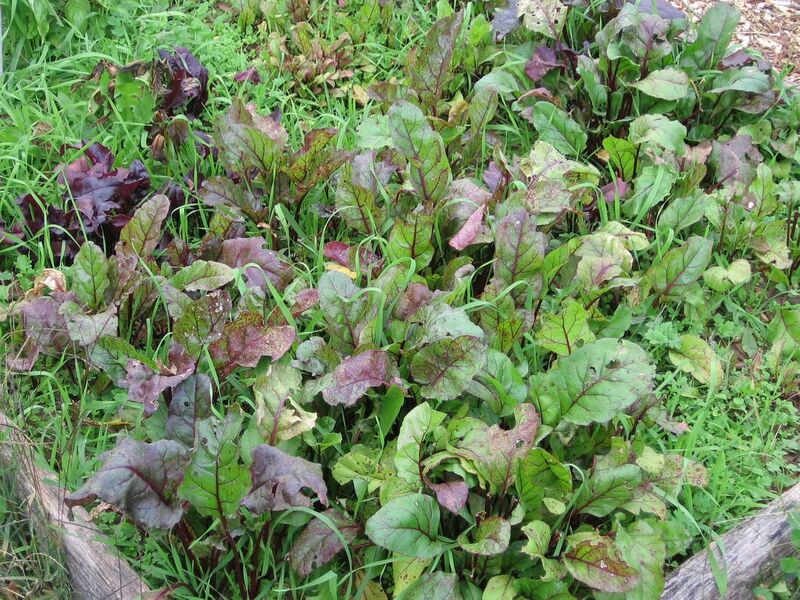 More tender salad greens without lifting a finger! 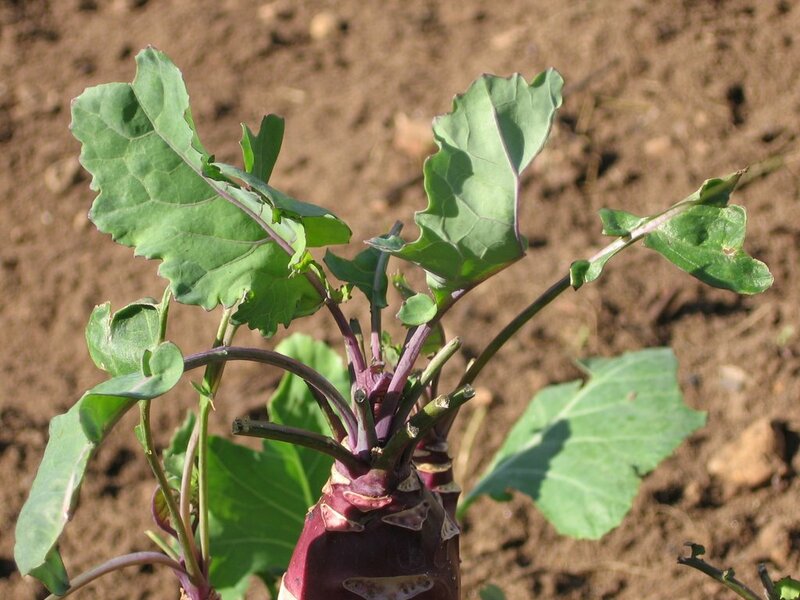 Easily started from seed, tough enough to withstand burning sun and freezing cold (including 21 degrees F the other morning), virtually maintenance free, and doesn't take death for an answer--purple kohlrabi is definitely my kind of plant. The beauty of vegetables is highly underrated. NOTE: This is my entry for Weekend Herb Blogging #55, a deliciously informative traveling event sponsored by Kalyn's Kitchen and hosted this week by Sher at What Did You Eat? 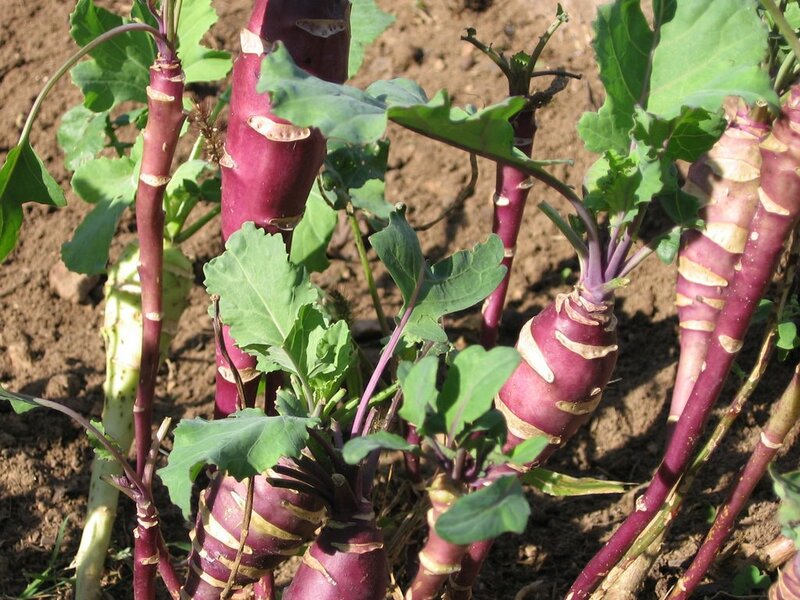 Food and garden bloggers from around the world participate, and you never know what interesting new edibles you'll discover each Monday in the roundup. Check out the WHB rules if you'd like to join in the fun, and click here for the list of upcoming WHB hosts. This is one of those rare occasions when my garden gives me lettuce and tomatoes at the same time. This is a mixed bed of heirloom lettuces that I (very heavily) direct seeded back on August 31st. (Click here to read more). For some reason quite a few of the seeds didn't sprout (the photo doesn't show the big patch of baby weeds happily filling in the other end of the raised bed), but the ones that did came in thickly. I always wait until lettuce seedlings get about this size before I start to thin them. That way they become people food rather than chicken food. Click here to learn how you can go from seed to salad bowl in less than a month (even if you don't have a garden). Welcome new visitors! Click here for a brief introduction to this site--and to learn why it's not just for gardeners. Fall salad greens are gorgeous. This mix includes Batavian Full Heart Endive, Red Russian Kale, Detroit Beet Greens, Bull's Blood Beet Greens (the dark reddish purple leaves), Swiss Chard, & Nero di Toscana cabbage. Everything was direct seeded back on August 8th. 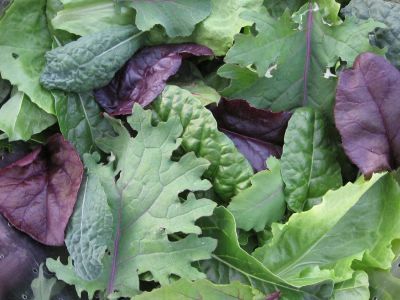 There are several other fall greens doing well in the garden and the greenhouse. Since I'm growing varieties that are both heat and cold tolerant, the crazy weather we've had these past few weeks (frost warnings follwed by a record breaking 88 degrees two days ago) hasn't killed off or harmed the plants in any way. Even the lettuce I started are heat tolerant varieties, but since the leaves are still so small, I doubt this brief heatwave would have turned them bitter even if they weren't. Note: Due to some really irritating technical difficulties involving my dial-up connection and Blogger, I'm taking an unplanned break from blogging for a while. Until I get things straightened out, I will post periodically if and when I am able. Click here if you'd like more details. I hope to be back blogging on a regular basis soon! In the meantime, if you don't feel like constantly popping by to see if anything new has sprouted here, I invite you to subscribe to In My Kitchen Garden via email. Just enter your email address in the box at the top right of this page and click on 'Subscribe Me!' 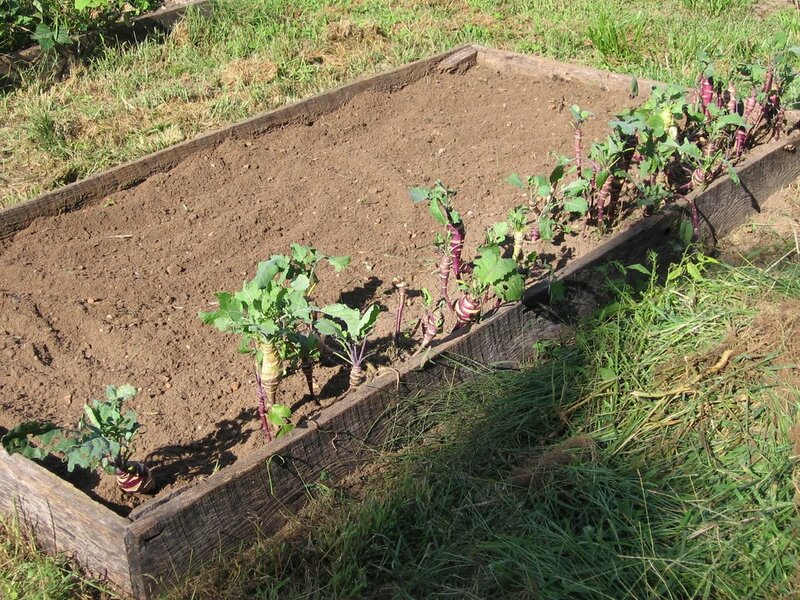 You will then receive all new In My Kitchen Garden posts via email. Thanks for all your support and wonderful comments over these past months. I'm so glad I started this companion blog to Farmgirl Fare, as I have really enjoyed sharing information and getting to know you and your gardens. And as we head into the slower pace of autumn, I look forward to catching up on all those things that went on in the garden this summer that I haven't had a chance to write about yet.